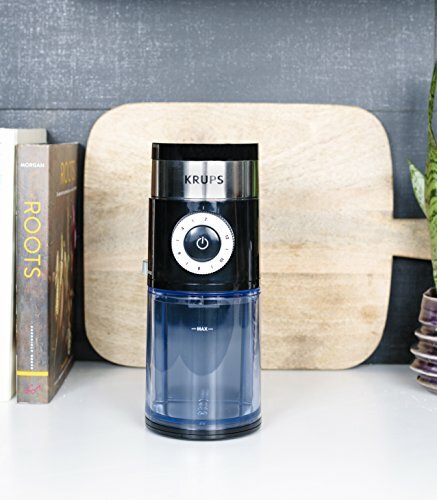 The Krups GX5000 Professional Burr Grinder is the perfect companion for the most die-hard coffee enthusiasts. 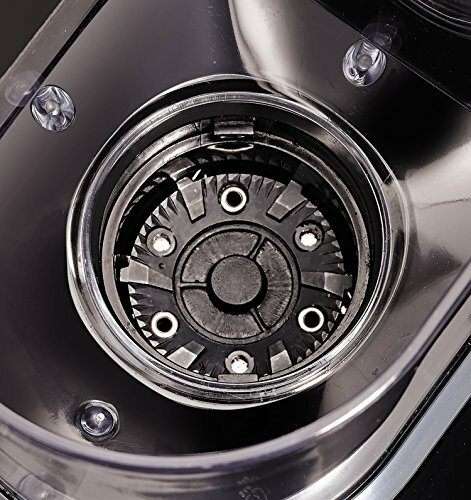 The ‘burr grinder’ in the GX5000 helps to keep the unit from overheating and helps preserve the unique aroma of any type of coffee bean. The settings allow you to control the texture of the grind: coarse for brewing in a French press, or very fine for perfect espressos. The clear container for the beans enables you to select the exact amount of beans you need to brew for your needs. Grinding capacity of 2 to 12 cups: You can easily choose how much coffee you want to brew and how many beans you need for the amount chosen. 45 settings in 9 steps: At first the settings seem overwhelming; but with a little time and practice, the settings are easy to use. Metallic flat burr grinder: Burr grinders give you greater control over your grinder than blade grinders do. Burr grinders also grind beans in uniform sizes. Burr grinder keeps unit from overheating: An automatic shut-off when done grinding means no worries about overheating and destroying the unit. Burr grinder preserves the aroma of coffee beans: Burr grinders chop in such a way that the beans release their fragrance, leaving the integrity of the taste and aroma alone. The bean and ground coffee containers are clear and easy to read: Simply choose the amount of coffee you wish to brew, then add the correct amount of beans for that brew. Both containers are labeled to show you correct amounts. Stainless steel and black finish: This modern burr coffee grinder is sleek in its simple design. Easy to clean and fits in with any decor. 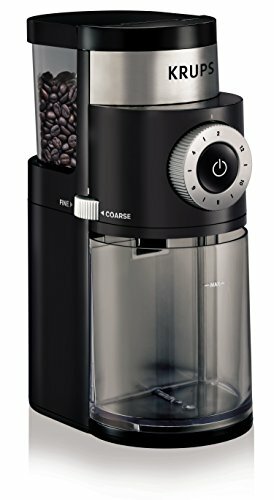 Safety Features: Two important safety features of the this electric coffee burr grinder are: this unit will not work if there are no beans in the container; and, the unit will not work unless the lid is firmly attached. Easy to use: You simply choose your desired setting and press the on button. Easy to clean: This unit comes apart for easy cleaning. A handy brush included with the grinder is great for reaching those tough to get to areas. Great for grinding espresso and spices: Although this grinder is great for grinding spices, it is best to purchase a separate one for your ground coffee and spice needs; grinding coffee and spices in the same machine means you will be cleaning it more often. Quieter than other types of grinders: Grinders similar to this burr grinder are very noisy. A quieter grinder means no more assaulted eardrums first thing in the morning. Automatic shutoff: Having an automatic shutoff means you can set the grinder and let it do its own thing while you get ready for the day. No need to worry that the grinder will continue running and overheat. Can have an inconsistent grind at times: Some settings just don't grind as well as you would want them to. Most settings end up creating some finely ground coffee even if that was not your intent. Grounds for French press often have coffee dust mixed in: Coffee dust in French press coffee gives the finished product a muddy, nasty taste. Coffee dust builds up too quickly: Because this unit has a bad habit of creating finely ground coffee with every setting, the dust from this coffee actually builds up quickly on the inside of the machine. This means you need to clean it more often than you would if this problem did not exist. Motor spins too fast to properly grind on each setting: The motor seems to spin at the same speed no matter which setting you put it on. This makes for inconsistent ground coffee - except for finely ground. 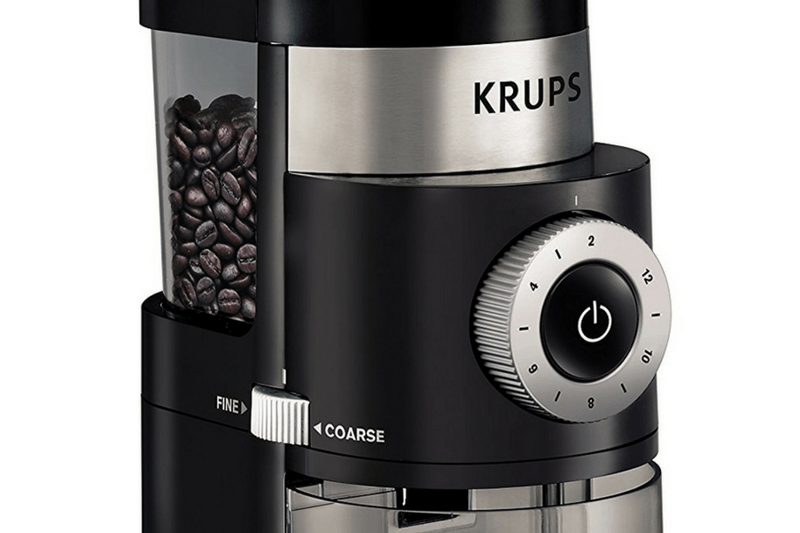 Overall, the KRUPS GX5000 Professional Electric Coffee Burr Grinder is a great grinder if you love espresso. The problems with inconsistent grinding means it often produces poor quality coffee grounds for most grinds. Those looking for perfection in their morning French press might be wise to skip this purchase. If you lead a more simple, less complex life, then this machine will work fine for all your needs.